Tiny whiteflies bugging Central Coasters this year; why so many? (Source: KCBY). DIY with classes at the UC Cooperative Extension in gardening and food preservation (Source: New Times). The UC Master Gardener Program of SLO County offers science based horticultural information to home gardeners. The program has been active for 21 years and currently has 105 active volunteers. The volunteers have developed and continue to maintain a 2/3-acre demonstration garden where they offer a free monthly workshop on a variety of garden related topics. 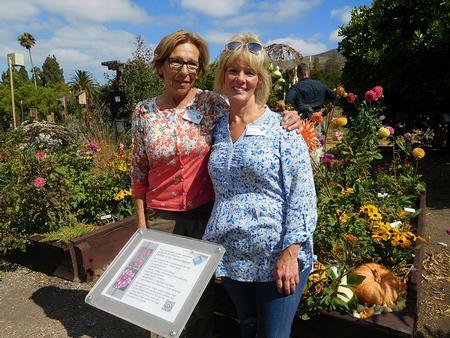 Master Gardeners also provide advice through gardening helplines based in Templeton, San Luis Obispo and Arroyo Grande and information tables can be found at farmers markets and festivals throughout the county. Thanks to the diligent work and data collection of the UC Master Gardener statewide program, we have very encouraging information about lessons learned by participants of the monthly Advice to Grow By workshops. SLO County workshop participants from 2018 were surveyed and here’s what they’ve learned. 100% of those surveyed reported choosing low water use plants. 80% of participants have installed or have improved drip irrigation systems and have improved their use of mulch. 60% have learned how to better use their irrigation timers or have installed new ones. 40% have reduced the amount of turf area in their yard and have increased their knowledge and use of captured rain water. 72% of participants have improved their pest monitoring practices, have reduced their overall use of pesticides and are more diligent in following pesticide label requirements. 64% have avoided planting or have removed invasive plants from their yards. 78% of workshop participants reported an improvement in plant selection practices. Selecting the right plant and planting it in the right place reduces the amount of inputs needed, such as your time and money, for it to thrive. Additional benefits reported by workshop participants include an increase in edible gardening, increased donations to the local food bank, and more time spent gardening and outdoors in general. Master Gardener volunteers plan to continue these good works with the slate of workshops planned for 2019. The next workshop is on April 20th, Grapes and Hops for the Home Gardener. Visit our calendar for future dates and topics. Residents are also invited to visit the garden for “Lunchtime in the Garden.” This new free monthly event begins Wednesday, April 3, from 11:30 a.m. to 1:30 p.m. and will continue the first Wednesday of each month through June. The garden is located at 2156 Sierra Way in SLO. Master Gardeners will be available to answer questions. Bring your lunch or just relax in a garden setting. Questions? Call 805-781-5939.